In which year was the British serial killer Levi Bellfield born? Your knowledge could win you a prize! 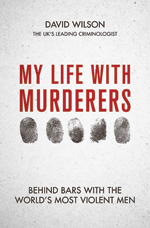 Just enter your answer and your details below – click on “send form” – and if yours is the first correct answer picked at random on May 1st, 2019, we’ll send you a hardback copy of My Life With Murderers – Behind Bars With The World’s Most Violent Men (published by Sphere; ISBN 978-0-7515-7414-2; £20.00) by David Wilson. Please click the reCAPTCHA below.